“Coach, change Younis” was the resounding incantation of the growing irritation of the Iraqi spectators on a cold March evening at the Pas stadium in Tehran. Finally after a late miss from the Iraqi captain, the switch of Hamadi Ahmed for Younis Mahmoud was made, arriving with exultation of the crowd. The Iraqi No.10 went onto retire months later and Hamadi expected to inherit Younis’ coveted position in Iraq’s frontline. That was until he left new Iraq coach Radhi Shanaishel in the lurch in the summer and packed his bags for Rio as one of Iraq’s wild cards at the Olympic Games, of course. With the Under 23s needing a goal against South Africa in their final group game to progress to the knock-out stages, the striker and his team-mates fired blanks in their brief excursion at the Olympics. His international career and the failure to make the striking position his own, has become his fait accompli. With Younis retired, MLS-based Justin Meram injured on the eve of a World Cup qualifier with Japan, all the in-form Hamadi could muster was a place on the bench. Adamant it was never going to happen for him, he snubbed the call-up – decrying that his passport was being renewed and that he was unable to fly. 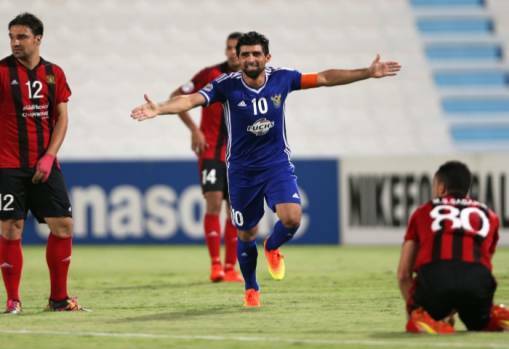 Unfettered and unrestrained by the similar obstacles at domestic level, 2016 had been one of the best years in the blue of Al-Quwa Al-Jawiya, for the striker the Baghdad club’s fans call the Butcher. Apparently paying his penance whenever he’s selected for the national side; remember he was dropped from the final squad for the 2015 Asian Cup, by his nemesis Radhi Shanaishel, the AFC Cup was his domain to give him the platform to demonstrate what Iraq had been missing. His deadly goal scoring pedigree, notching 15 goals across the tournament took the Blue Falcons to the final in Qatar in November. At the Suheim Bin Hamad Stadium in Doha, his sole strike was enough to win the game and see Iraq’s oldest club side become the first Iraqi club to win an Asian club competition, while personally taking home the MVP award and the prize for the tournament’s top scorer. Hamadi was also nominated by the Asian Football Confederation as one of the continent’s top three players, eventually losing out on the crown to UAE playmaker Omar Abdulrahman. Hamadi Ahmed has been in prolific form in 2016,﻿ putting aside his wrangles with the Iraqi FA and national coach Radhi Shanaishel after reportedly snubbing a call-up to the national team recently. Hamadi has been unplayable in Al-Jawiya’s AFC Cup run, scoring in every game in last year’s competition, nettuing 16 times in 11 appearances in the AFC Cup. The Al-Jawiya forward was also in red hot-form domestically with 12 goals in the Iraqi League last season. The 33-year-old hailing from the province of Salah-Al-Deen led the grand old Air Force club to a historic first Asian cup title, the first in Iraq’s football history with the winning goal in the final in Doha against India’s Bengaluru FC, and also picked up the MVP award of the tournament.